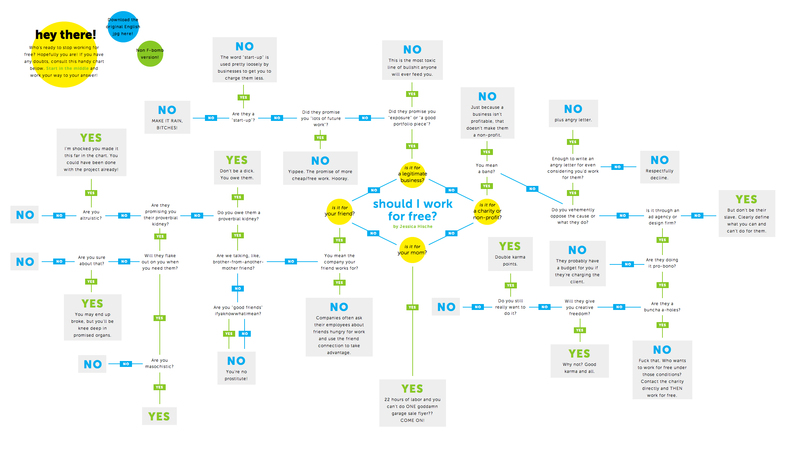 No, you shouldn’t work for free. But that doesn’t mean you should get paid every time you pull out the camera. Imagine if Yo-Yo Ma only picked up his cello during a concert at which he was paid to play. Preposterous, right? The gentleman practices. He practices by himself. He practices with others. He imagines himself practicing. He tries new things that a concert hall would never have hired him to do – that is, until they see how great those out-of-the-box ideas are, and then they want to hire him at any cost. He wouldn’t be the musician he is without picking up his cello and making music when he wasn’t getting paid to do it. Now, imagine Carnegie Hall comes up to him and says “Hey, Mr. Ma, how about you come play at Carnegie Hall? It’ll be great exposure for you.” And he says sure, I’ll send you my contract. And Carnegie Hall says “Oh no, we don’t have the budget to hire you, but it’ll be great exposure and you know, it’ll get your name out there.” Should he do it? Absolutely not. Maybe if the proceeds of the concert were benefiting a good charity, but definitely not so Carnegie Hall could benefit from his talents while giving nothing in return. The difference between working for free and working on your craft is the answer to this question: Who initiated the shoot, and why? When a potential paying client comes to you and asks you to do something for free, that would be working for free, and that’s a bad idea. But practicing on your own, allowing time for happy accidents, pushing your limits? That’s not “working for free.” That’s becoming a great artist. No one is going to pay you to become a great artist, they’re going to pay you to give them something they want. To get people to hire you for your vision of what art can be, you have to show them your vision. This is not a novel idea. David Hobby, Chris Crisman, Chase Jarvis, Matthew Jordan-Smith, Nick Onken, and countless others have been preaching this for years. Personal work, initiated by you, allows you to shoot exactly what you want – and people who are excited by that will want to hire you to shoot more of the kind of work you love. 1) Working for a paying client: You provide them with a service for a fair rate in return. No problems here, but do note that clients usually don’t hire you to create work outside of what is in your portfolio. Much like certain actors end up getting cast in the same type of roles over and over (Hugh Grant as the neurotic but endearing fool, Alan Rickman as the villian), shooting only work people hire you to do can get you stuck in a rut that you might not want to be in. 2) Working for free: I define this as “getting taken advantage of by someone who should be paying you.” The word “free” implies that a price should be involved. Avoid this. And consider it a red flag when someone tries to get you to do something and claims you’ll benefit from the “exposure.” There are circumstances in which exposure is worth it, and it’s usually not when someone else suggests it. It’s frequently better to create your own exposure on your own terms by creating your own projects for which you have full creative freedom. 3) Charity work. Charity work is the only situation in which I’ll happily photograph without pay and without much creative freedom. Helping others brings priceless energy and makes the world a better place. Be wise about how much pro bono work you take on – there’s a reason many volunteers and nonprofits suffer from burnout. You want to be sure you are around to serve them again in the future! 5) Personal Work: Pushing your creative limits to do things that most clients wouldn’t hire you to do, but which they’ll probably jump on board with when you succeed. Because personal work is initiated by you, you won’t get paid, but there are clear downstream benefits of personal work. I distinguish (semantically) “personal work” from garden-variety “portfolio-building.” Portfolio building is commonly used to describe what a beginner does to create some standard work to help bring in paying clients. Personal work pushes you past your comfort zone to create new work that will reach new audiences or to refine more advanced skills. It’s okay if you use the terms differently than I do, the point is that there is a difference between creating a starter portfolio of good work while learning, and pushing yourself beyond that even when you’ve reached the point where people regularly pay you for photography. Of course, whenever you do portfolio-building or personal work, you run the risk of creating an audience with an expectation of freebies. Come back tomorrow and I’ll show you how to avoid this. Fear of Success: Do You Have One Of These 6 Symptoms? Write About Yourself So Clients Will Listen – Free Mini Course! Have a Photo Problem? Try Canonical Perspective. Great article. I have read other articles on this subject but this narrates things in a different light. Building a portfolio and training are good points. Except for charity work, the only ones to WORK for free. Really good article! I came across it after I wrote a similar one for my blog. It’s sad that people think that to get a foot in the door you need to work for free. That’s bad for the industry on so many ways!